EPA-DHA Balance contains ultra-purified and highly concentrated omega-3 fatty acids from fish oil. EPA-DHA Balance offers synergistic benefits from both important omega-3 fatty acids in a 2:1 ratio. Purified by molecular distillation. Meets stringent CRN and proposed USP monograph standards. Manufactured according to Good Manufacturing Practice (GMP) requirements. 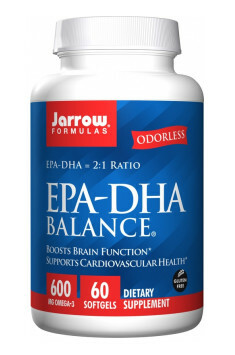 EPA and DHA support cardiovascular, brain and joint function and may promote positive mood. The doses of omega-3 fatty acids may vary depending from supplementation purposes. The minimum serving of EPA and DHA needed for healthy functioning of the whole body is 250 mg (in total) and can be effortlessly provided in a varied and balanced diet. The American Heart Association recommends the intake of at least 1g of omega fatty acids. This dosage can prevent cardiovascular diseases, atherosclerosis and hypertension. If omega-3 supplementation is aimed at reducing inflammations in the body, the daily dosage of 6-8 g divided throughout the day will be remarkably effective. Natural strawberry flavor and mixed natural tocopherols. Softgel consists of gelatin, glycerin and purified water. A high dose of Saccharomyces boulardii probiotic yeast. It prevents diarrhea of various etiology. Complex of probiotic bacteria supporting the functions of intestinal barrier. Effective after antibiotic therapy.